One of the most striking monuments in Ayutthaya Historical Park, the central Khmer-style prang at Wat Ratchaburana stands as Ayutthaya’s tallest stupa. 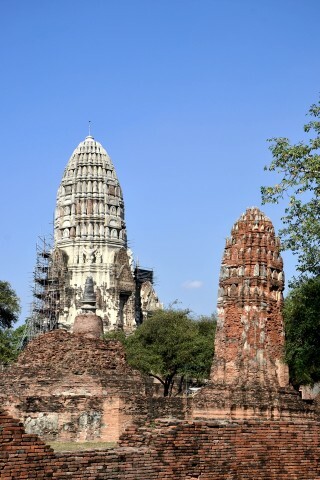 Browse places to stay in Ayutthaya on Agoda.com. Free cancellation. A convenient location, breathtaking frescoes and quirky history all help to make the sizeable complex another of the city’s must-see sites. In 1424, the death of King Intharacharthirat left the throne open to one of three sons. Two of the eldest took each other on in an elephant duel that left both of them dead. With them out of the way, a third, apparently more patient, brother by the name of Borommorachathirat II (or Chao Sam Phraya) ascended the throne. He went on to tighten Ayutthaya’s control over the Chao Phraya basin, subjugating Phitsanulok and invading Angkorin a move that’s viewed as a final cause for the Khmer Empire’s southeastern shift. The invasion also resulted in Ayutthaya borrowing elements of Khmer culture and taking many Khmer slaves, including artisans who were adept at constructing the distinctive corncob-shaped prangs found at Angkor and many other ancient Khmer sites. Chao Sam Phraya commissioned a large prang to be built at Wat Ratchaburana, establishing the temple on the site of his brothers’ fatal fight. Nearly six centuries later, it still stands alongside a second, smaller prang. Though the main crypt was looted in 1957, you can still climb the steps to view exquisite 15th century frescoes depicting scenes from the Buddha’s life. Also note the headless Garuda images that hold up the main prang at its base, and the many broken, headless stone Buddha images that surround the complex. The entrance to Wat Ratchaburana is across Naresuan Rd from Wat Mahathat.